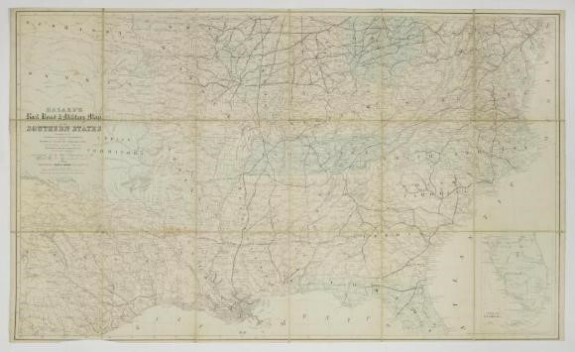 This map, prepared by the Philadelphia Board of Trade in 1862, was designed to help merchants in Philadelphia to understand the volatile geographic situation of the South during the Civil War. 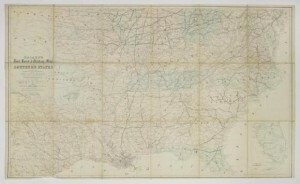 Preparation of maps and reports were among the many functions of the Philadelphia Board of Trade. Services such as these led the Philadelphia Board of Trade to become the largest such organization in the nation by the middle of the nineteenth century. Born in 1805, John Welsh became an extremely successful merchant known throughout the United States. His wealth enabled him to become a philanthropist who promoted many causes, including the Civil War-era United States Sanitary Commission, which he served by chairing the Philadelphia Sanitary Fair in 1864. He also endowed a chair at the University of Pennsylvania. 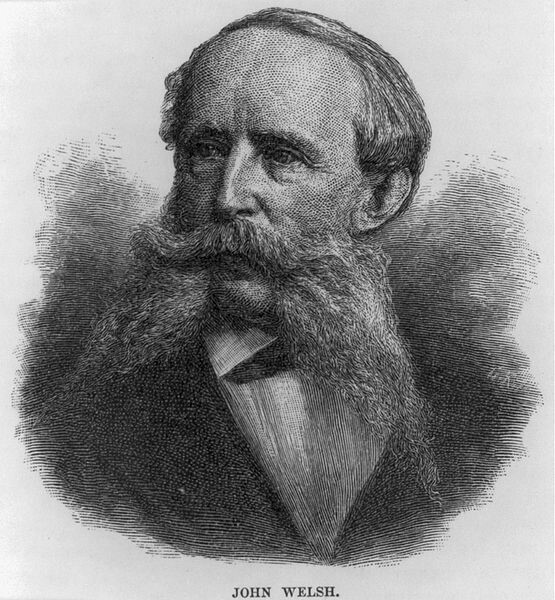 Continuing his prominent role in the Philadelphia business community, Welsh served as the president of the Philadelphia Board of Trade between 1866 and 1881, a period of growth with a membership of 1,433 by his third year. 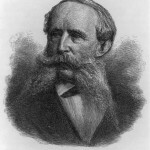 He also served as Chairman of the Board of Finances of Centennial International Exhibition of 1876 and as U.S. minister to the United Kingdom from 1877 to 1879. An example of Greek Revival architecture, the Merchants' Exchange Building served as the commercial center of nineteenth-century Philadelphia after its completion in 1834. The building hosted the Philadelphia Board of Trade, the Philadelphia Stock Exchange, marine insurance companies, and merchant trading organizations. This central location, with a post office located within the building, enabled the business community of Philadelphia to participate in national and international commerce. From its place in this centralized Philadelphia business community, the Board of Trade promoted Philadelphia as a credible economic and financial rival to New York City. By 1920, the Philadelphia Chamber of Commerce surpassed the Board of Trade as Philadelphia’s leading organization for business. 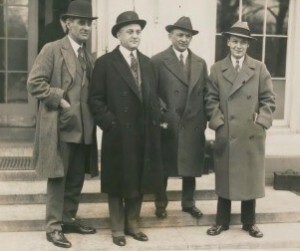 The Chamber became so powerful that in 1927 its members (shown here) represented Philadelphia’s efforts to host the next Republican National Convention to President Calvin Coolidge. 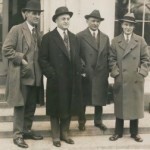 Pictured at the White House, from left to right, are George B. Christian, Albert Greenfield, Fran L. Devine, and Albert Klein. The Philadelphia Board of Trade experienced its heyday in the mid to late nineteenth century under the leadership of John Welsh. When a second Philadelphia Chamber of Commerce formed in 1891, it divided the Philadelphia merchant community over the question of how to promote economic and financial growth. Philadelphia’s Board of Trade worked for more than a century to promote commercial development in the city and the region while also arbitrating disputes among its member businesses. Formed in 1833, the board filled unmet needs for economic development and became the largest organization of its type in the nation. The original concept for the organization had its roots in England during the colonial period. From 1675 until 1696, the Lords of Trade, also known as the Lords of Trade and Plantations, watched over the affairs of the American colonies. In 1696, King William III (1650-1702) replaced the Lords of Trade with eight paid commissioners tasked to promote trade for the American colonies and its plantations. 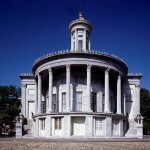 These commissioners became the Board of Trade, acting as an advisory body overseeing the American colonies. The board did not have executive or legislative authority, but it represented the British government in making policy for the American colonies. In addition to assuring that laws passed by the colonies’ legislatures benefited British trade policies, the board nominated governors for the colonies, recommended laws to the British Parliament that affected the colonies, and listened to colonialists’ complaints regarding the actions of its administrators. Philadelphia’s Board of Trade also followed American precedents, such as the New York Chamber of Commerce, which began operating by 1768 to promote business development and settle commercial disagreements. In Philadelphia, the Board of Trade formed as a counterweight to the Chamber of Commerce. 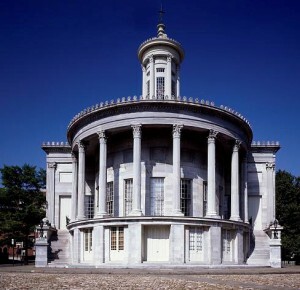 Created in 1801, the Philadelphia Chamber of Commerce focused on encouraging shipping and arbitrating commercial disputes among its members, not on promoting the city’s general economic development. The chamber limited membership to ship owners, exporters, and importers, and marine insurance brokers. In 1824, notable individuals from Philadelphia also formed the Pennsylvania Society for the Promotion of Internal Improvements in the Commonwealth to develop a system of state-run canals and railroads from Philadelphia to Pittsburgh. Although the society succeeded in creating a complex and costly system of intertwined canals and railroads, New York had already developed the Erie Canal and its parallel rail system. Philadelphia experienced another economic setback in 1832 when the Second Bank of the United States, headquartered in the city, failed to be rechartered. The Philadelphia Board of Trade, created by local merchants in 1833 to combat the restrictions imposed by the old Chamber of Commerce, sought to keep pace with the growing port cities of New York and Baltimore by developing and promoting Philadelphia’s economic infrastructure and financial future. The board began with 220 members, more than three times the membership of the city’s Chamber of Commerce. Less than thirty years later, after merging with the city’s early Chamber of Commerce in 1845 to better represent commercial and industrial interests, the Board of Trade had 730 members. By 1869 it reported 1,433 members. Its phenomenal growth enhanced the city’s credibility as an economic and financial rival to New York City and Baltimore. By the middle of the nineteenth century, the Board of Trade had become the largest such organization in the United States, so popular that it led to the creation of the National Board of Trade in 1869. A key figure in the growth of the Philadelphia organization was John Welsh (1805-86), who served as its president from 1866 until 1886 and as president of the Board of Finance for the 1876 Centennial Exhibition. Over the decades, the consolidated Board of Trade facilitated commercial development in Philadelphia and arbitrated disputes between its members. The board helped, so far as it could, with improving the channels of the Delaware and Schuylkill Rivers, expanding and bettering the city’s harbor facilities and traffic control, recording the value of foreign imports into Philadelphia, and advancing the interests of the business community. Annual statistical surveys tracking the city’s economic growth and trends in industrial development became a key service. These annual reports gave business owners, leaders, and policymakers documentation of Philadelphia’s economic growth and the diversity of its industries and businesses. 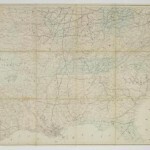 This eventually put pressure on the federal government to improve its own record-keeping, collection of economic and financial statistics, and the methodology of the U.S. Census. The reports also demonstrated that the Board of Trade’s interest in expanding its membership beyond local merchants to the greater Philadelphia business community. Philadelphia’s economy consisted chiefly of small businesses employing relatively modest numbers of workers. But it also had large industrial firms that produced a diversity of products such as carpeting, hardware and tools, furniture and interior decorations, boots and shoes, railroad cars, and chemicals, just to name few. Some were truly large employers, such as the Baldwin Locomotive Works at Broad and Spring Garden Streets, which had nearly 3,000 workers prior to the Panic of 1873. Statistics gathered by the Board of Trade showed that Philadelphia’s manufacturing output reached an estimated $500 million around 1870, its peak year in production. In 1875, the clothing industry produced more than $24 million in manufactured goods; iron manufacturing had production valued at more than $41 million; and exports of refined oil from Philadelphia reached 55 million gallons valued at over $14 million. A second Chamber of Commerce formed in 1891, which again divided Philadelphia’s efforts to encourage economic and financial growth. The new chamber surpassed the Board of Trade as the city’s leading organization for businesses, publishing a twice-monthly economic bulletin that reached 6,800 members in 1920. In 1942 the Board of Trade disappeared after merging with this second chamber. The latter organization expanded its scope regionally in 1958 to become the Greater Philadelphia Chamber of Commerce. In 1982 the Philadelphia Stock Exchange, on its own authority, revived the board’s name, if not its functions, by creating an in-house venue for trading currency and other futures called the Philadelphia Board of Trade. This quite successful subsidiary’s operations were folded into the exchange known as PHLX after NASDAQ purchased a controlling interest through a 2007 agreement. A key nineteenth-century institution for gathering economic data and harmonizing diverse business interests, Philadelphia’s Board of Trade found itself superseded by the Philadelphia Chamber of Commerce in the early twentieth century, then was absorbed by it, reappearing just briefly in a sharply-different context before vanishing entirely. Arthur S. Guarino is Assistant Professor of Finance at the Rutgers University Business School teaching courses in Financial Institutions and Markets, Corporate Finance, Financial Statement Analysis, and Financial Management. He has published articles dealing with economic history and the role of finance and economics in public policy. Benson, Lee. 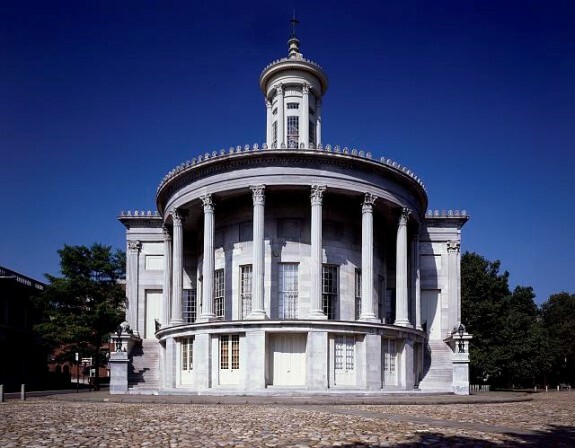 “Philadelphia Elites and Economic Development: Quasi-Public Innovation during the First American Organizational Revolution, 1825-1861.” Working Papers from the Regional Economic History Research Center, 2, 2 (1978): 25-54. ____. “Demand, Markets, and Eastern Economic Development: Philadelphia, 1815-1840.” Journal of Economic History, 35 (March 1975): 271-73. Weigley, Russell F., ed. Philadelphia: A 300-Year History. New York: W. W. Norton, 1982. Cope, Thomas P. and George Toland. “Philadelphia Board of Trade.” Hazard’s Register of Pennsylvania, January 4, 1834, Volume 13, Issue 1, 2-3. Philadelphia Board of Trade Records, Historical Society of Pennsylvania, 1300 Locust Street, Philadelphia. Merchants’ Exchange Building, Third and Walnut Streets, Philadelphia. Early office location for the Board of Trade. Philadelphia Bourse, 111 S. Independence Mall East, Philadelphia. In 1900, location of offices for the Philadelphia Board of Trade and National Board of Trade. Philadelphia Stock Exchange, 1900 Market Street, Philadelphia. (Nasdaq OMX PHLX) The Philadelphia Stock Exchange formed a subsidiary, the Philadelphia Board of Trade, in 1984.